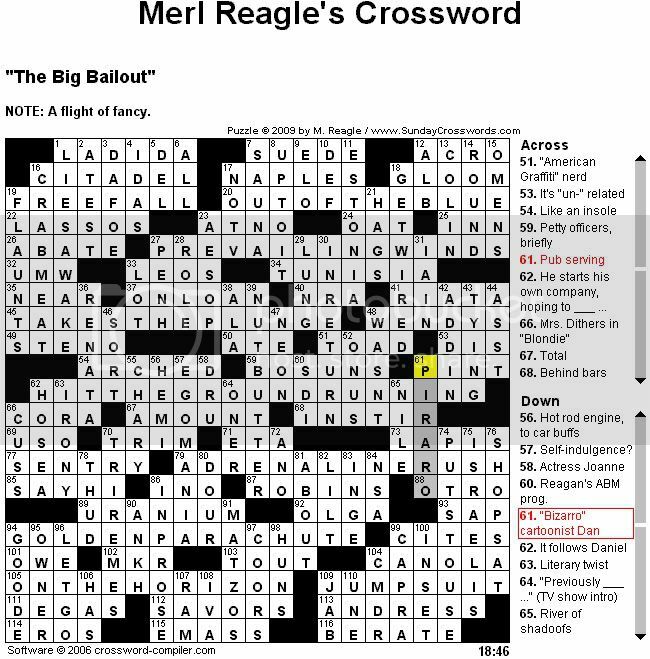 I don't know if this will make you feel any better (about low self esteem comments) but after looking over the crossword puzzle, I think your name is the only one of the up or downs I would have been sure of (except for the exact spelling, because I can never remember if it's one "r" or two). Anyway, congrats and thanks for sharing the recognition with us, Pizzaro. Just click the link there for "this week's puzzle" of course, but obviously that will only work until next sunday's puzzle comes out—at which time the 7/19 one will still be available by subsequently clicking back through the archive links week by week from the current puzzle. The archive itself appears to only go back three weeks, so after that the "Bizarro" puzzle will likely disappear forever. I took the time to fill in all my answers online and then do a screen capture of the result with 61D highlighted. The resulting image is much cleaner than the scan of my original scribbled-in-by-hand puzzle grid. 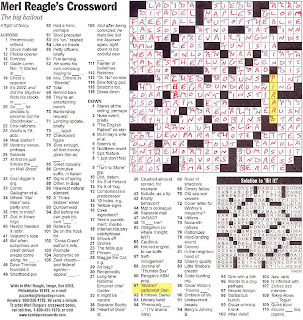 Congratulations on the worldwide notoriety and accolades that result from being a famous crossword puzzle and quiz show answer! "without a single magazine cover to his name"
In the late '80s and early '90s, in any newspaper I found around me, your cartoon regularly featured right next to Gary Larson's. I still vaguely associate the two as natural side-by-side features: not identical in style, but similar enough to set them apart from the vast bulk of the "funny" pages. It was with great surprise that I learned just a couple of years ago that you're not actually as well known as Gary! But you ought to be. Hmmm, I don't know if you're so much an act of fredness, as an exemplar of, uh, demi-fredness? I've only recently (and barely) caught some local Six Flags Great Adventure commercials that happened to use the word Bizarro. I saw the ad again tonight and paid closer attention to hear them reference the "Bizarro Coaster." And here's a Wikipedia page on the Great Adventure one (NJ). I'm sure you got a nice fat check for licensing the name, right? And if they have pieces of pie, eyeballs, UFO aliens, and dynamite hidden along the coaster path then they're just blatantly ripping you off if you didn't license it. here's something that might make you feel even better, although i know they haven't named any insects after you, yet.